This chapter gives an overview of some of the main attributes of snow and ice of relevance to the cryosphere's role in the climate system. Many of the unique properties of water extend into the solid phase, making ice a quirky and intriguing material. Its low density allows ice to float, and the high values of specific heat capacity, enthalpy of fusion, and enthalpy of sublimation make snow and ice a substantial "energy sink" with respect to exchanges of energy between the atmosphere, ocean, and Earth surface (see chapter 8). The low thermal conductivity of snow also makes it one of the best natural insulators known. Finally, the high reflectivity of snow and ice, combined with the large seasonal variability in snow and ice cover, make this the most variable and influential component of Earth's surface albedo. Changes in snow and ice area have an impact on the global energy budget. The next chapter provides more detail on the surface energy balance. Implications for global climate are discussed in chapter 8. I have restricted the focus of this chapter to climate-related attributes of snow and ice. Many other physical properties of snow and ice are of interest, including their mechanical, electrical, hydrological, and microstructural characteristics. Important examples include bonding and shear-failure modes within mountain snowpacks, which need to be understood for avalanche mechanics, and the engineering properties of permafrost and sea ice. 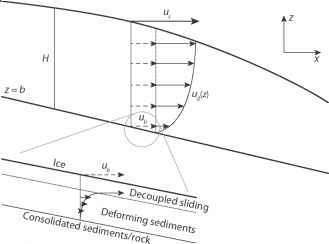 The mechanical strength of sea ice under compression and flexure are important design criteria for construction of marine structures (e.g., bridges, oil rigs) at high latitudes, for instance. A tremendous collection of technical reports from the U.S. Cold Regions Research and Engineering Laboratory (CCREL) in Hanover, New Hampshire, documents the physical and engineering properties of snow and sea ice. Readers are referred to the classical text of Hobbs (1974) for a comprehensive treatment of ice physics.